In Ophthalmology, as in many other fields, "innovation" is always regarded as a golden word and there are countless doctors/researchers at any time looking for better ways to treat a given eye condition. True innovation requires a number of qualities on the part of the "innovator", and perhaps it's as good a time as any to re-visit the stories behind some of the greatest inventions of the twentieth century. He came from a family of doctors and clergy, and once was a lapchild of Florence Nightingale. His father was an ophthalmologist, and following a distinguished stint in medical school received the FRCS (Fellowship of the Royal College of Surgeons) at the tender age of 25. Even around this time, before formal training in eye surgery, he had begun discussing the possibility of replacing crystalline lenses after cataract surgery with his father and close associates. In 1940, Flight Lieutenant Gordon Cleaver was returning from a sortie in his Spitfire. In his haste to get into the plane that morning, he had forgotten his flight goggles, so when a bullet smashed through the canopy of his fighter, bits of perspex plastic from the canopy were blown straight into his eyes. In the end, he underwent 18 operations on his eyes and face, many of which were performed by this doctor. It used to be said (something to the effect of) 'Thou shalt not have a foreign body in the eye'. And yet, it was quite clear in this particular patient that some of the remaining plastic pieces in the eye were not causing any problems even years after the original injury. So this young doctor spoke with some spectacle manufacturers and eventually a small perspex disc similar in shape to the original crystalline lens was produced. 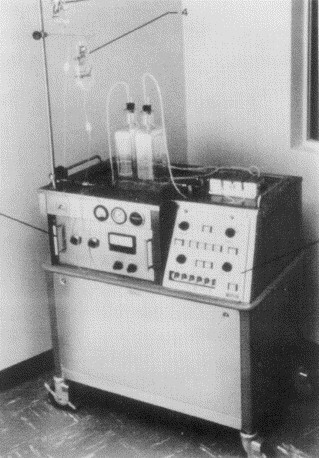 This was implanted into the eye of a patient on 29 November 1949. It wasn't long before he felt the full force of hostility (and some might say jealousy) from his peers. For several decades, the topic was not even given a section for presentation and discussion at conferences. By the 1970s, though, the unquestionable benefits of implants over thick aphakic glasses were apparent and with improving lens designs, better results were also being seen around the world. Today, it is the unusual patient who does not get a lens implant. The question has become 'why didn't this patient get an implant?' rather than the other way round. 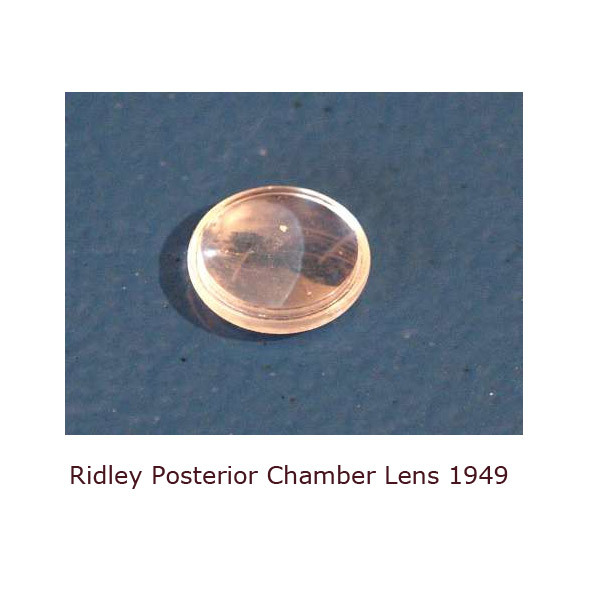 And of course, this was the story of Harold Ridley and the intraocular lens implant, which has revolutionised eye surgery in fundamental ways. He was a bit of a maverick, but a persistent one at that. Finding himself unable to get into medical school in the United States, he applied and got accepted into the University of Geneva Medical School in Switzerland, where for a time he was spending more time composing music than on his medical studies. But fortunately for all of us, graduate he did, and became heavily involved with research into better ways of doing cataract surgery. In the mid 1960s, he was given US$299,000 to find a way to remove cataracts through a small incision (cut). Going through more than 40 different ways of doing so, including a meat grinder (!) type of device, he failed every single time and was close to despair. " I thought I might face defeat better if I looked better, and so I prepared," this doctor wrote in his 1985 autobiography Through My Eyes. "The haircut came first, then a shoeshine, and finally, the dentist." At the dentist's, he was very taken with the then also new method of removing calcified plaque with an ultrasonic cleaner. After many hundreds of modifications later, including refinements in technique from many other surgical experts, we now have almost one day visual rehabilitation, with many patients achieving better than 6/9 vision on the first day after surgery. Of course, I'm talking here about Charles Kelman, the legendary inventor of phacoemulsification, which is the gold standard for cataract surgery nowadays. A common thread that runs through these innovators seems to have been a long standing conviction that something was not quite right and could be done a whole lot better. Although it seems so obvious to us nowadays, it took long and winding roads before conviction was translated into innovation. But for serendipity, sometimes, nothing might have come of it. It has been said (on Ming Thein's blog and perhaps others) that he who tries 99 times and fails is seen as a fool, while success on the 100th time is a sign of great persistence in the face of adversity. Perhaps the frustration and fear of failing just before success is as good a motivating force as any! For all the success that we see sometimes, I think the respect we accord to these pioneers should include a great dose of not just awe for their genius and intellect, but also their willingness to risk everything (peer respect and sometimes even careers) and to persist in the face of great adversity. In fact, it seems like the greater the uproar created, the greater the invention! The ability to think laterally and to find uses for seemingly unconnected things is also priceless. And to this end, I have viewed the increased sub and sub-sub specialization of the medical specialties with some concern, since the narrower world view could discourage cross-discipline exchange of ideas and methods. As always, it is the devil in the details, finding the right balance between craziness of an idea and potential for success, and decisions regarding the distribution of limited funds, that will determine the success or failure of future endeavours. This was a really inspiring story for all the eye doctors out there. This is something all need to read and I believe this will inspire them like nothing else. Greetings from http://www.boisemountaineyecare.com/"
Nice details about eye care.